Over a 3-month schedule, a curious roadshow has been rolling across the wilds of the Northern Cape – and also popped over the provincial line into the Free State. For locals who’ve sighted the convoy, this has been a surprise, a delight – and a way to get to know more about what AfrikaBurn is, and how they could get involved. Allow us to explain. Since the 28th of June team of artists, photographers, filmmakers and theatre-makers has been travelling widely across the region that our main event is held in, as a means of broadening engagement with communities in the Northern Cape and neighbouring areas. The project – the Blank Canvas Express – was initiated in consultation with a number of arts practitioners in the AfrikaBurn community, and also the wider regional arts community. Funded by the National Lotteries Commission, the aim of the initiative is to bolster arts development through a series of workshops, engagements, exhibitions and artwork installations. Memnoc Collective at the William Humphreys Art Gallery (WHAG). Kicking off, the first foray saw its first stop on Tuesday 10th July, at William Humphreys Art Gallery in Kimberley. In true eclectic style, the evening showcased Lost Couple Find God mask performances from the Memnoc Collective and local musician QrasVu who topped and tailed a presentation and Q&A session led by our Co-founder and Creative Lead Monique Schiess. It was part of a six-week photographic exhibition at WHAG featuring Simon O’Callaghan’s work from his self-published coffee table book Burn – Into the Flames of Burning Art and the screening of the short documentary Copper Ashes by Dewald Brand, Herman du Toit and Michael Zommer. In total, 2177 people saw the exhibition during the run. Moving Images Performance Workshop, Galeshewe. The tour continued to neighbouring Galeshewe on 11th July, where the Memnoc Collective hosted Moving Images, a physical and image theatre workshop at the Mayibuye Centre, utilising image theatre, mask performance and puppeteering. The full day workshop was free open to local artists and theatre-makers 18 and over. On Thursday 12 July, the motley crew hopped over to the Vrystaat Kunstefees in Bloemfontein where Memnoc Collective created a puppet and mask street performance at Hoffman Square. Afterwards, AfrikaBurn artists and organisers hosted an engagement session at Vrynge Farm, on the UFS campus, which again showed a screening of Copper Ashes, along with a presentation and Q&A session. .
On August 16th, the next expedition kicked off with much loading of artworks and installation equipment at the AfrikaBurn workyard at our HQ in Salt River, Cape Town. 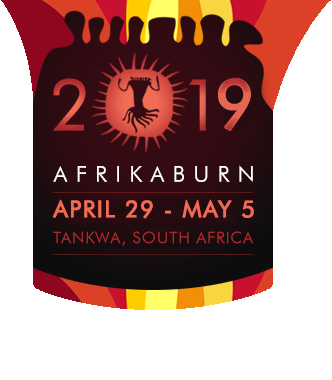 After discussions with Namakwa Tourism, a series of sites were identified where artworks could be exhibited and installed in public spaces, as a means of repurposing art from AfrikaBurn 2018 and giving back to the province that has hosted our event since 2007. Among the works that hit the road were Sleepyhead II (by The Mighty Mighties) and The Shrine of Lost Moments (by Mephy Kling and her crew of Berlin Burners). Sleepyhead II, sleeping serenely among the blomme of Nieuwoudtville. Once Sleepyhead II had been safely erected, the team (consisting of longstanding ex-Director, ex-DPW lead and now AfrikaBurn elder Paul Grose, present Director and DMV lead Robert Weinek, arts practitioner Maike Hitzeroth and DPW member and longstanding burner Lebohang Litsili) headed off to the Fred Turner Museum in Loeriesfontein. Here, they erected The Shrine of Lost Moments outside the museum. There it now stands – and its many LED’s are fully functional, thanks to the work of volunteer circuitry wizard Shen Tian. Shrine of Lost Moments, Loeriesfontein. Next up, the team headed off to Calvinia, where Namakwa Tourism invited our team to take a part in creating an AfrikaBurn exhibition in the local Museum. This exhibition has taken the form of a display of many postcard-sized illustrations, sketches, drawings and prints created by the citizens of Tankwa Town, which were originally displayed in the Artefactory at Off-Centre camp at this year’s event. Printed copies of the postcards are available at the exhibition for visitors to take home and use (and even possibly deposit in the world’s largest postbox, which is in the centre of Calvinia). Postcards are also available at Fred Turner Museum and Nieuwoudville’s tourism office. Lastly in Round II, arts magicians Angela Macpherson and Leesham Stringer (the latter also a member of DPW) made their way to Calvinia to host a mask-making workshop with learners from Hantam Primary School and a rieldans performance by the Calvinia Sitstappers, thanks to the support of Namakwa Tourism and the Karoo Youth Foundation. Look out for further news on the next rounds of the Blank Canvas Express, as it continues its journey into the wilds of the Northern Cape and beyond – and thank you to all involved in setting the roadshow in motion.